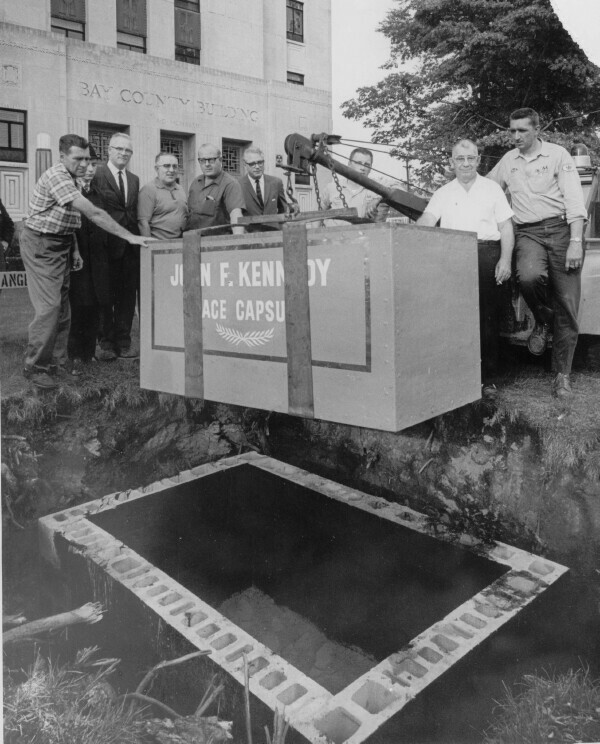 Sometime in September of 1965 the Bay County Labor Council, which included the ship builders union from Defoe, members of the UAW, and representatives of assorted other trades, buried the "John F. Kennedy Peace Capsule" in front of the Bay County Building. The capsule was donated to the Bay County Historical Society (BCHS) with instructions that it be unearthed and opened in 100 years. A short time later those instructions were changed in a letter from the Labor Council to the Historical Society requesting that the capsule be opened in 50 years. Minutes of the Society show that the board voted to honor that request. And now fifty years have passed. It's time to open the capsule. Ron Bloomfield, director of the BCHS, working with Tom Hickner and the County Commission, arranged for the capsule to be dug up today. Depending on the condition and other factors Bloomfield hopes to open the vault tomorrow and possibly display items at the Sesquicentennial celebration at the Museum on Saturday. At 9:30 on Wednesday, Jon Morse, County Superintendent of Buildings and Grounds, and his staff were on hand with heavy equipment to raise the vault. A crowd of reporters, citizens and officials all gathered to watch Grounds Supervisor Blake Coppinger and backhoe operator Tim Fedak as they figured out how to get thousands of pounds of concrete off the vault and then get the capsule out. Among those watching were Bloomfield, Angie Miller of the Greater Saginaw Bay Central Labor Council, and Cristen Gignac, Director of Recreation and Facilities. Getting the vault out was not as easy as it might sound. The pit had been prepared with a cinder block wall into which the vault was placed. A huge concrete slab was placed on top of that and the entire enclosure was buried under a foot of soil. The first step was to lift that concrete top. The backhoe was used to move the slab then chains were attached. Everyone backed up a few more steps as the chains first strained, and groaned... then broke free with a loud crack. Abandoning that effort, Tim used the backhoe to just lift the end of the slab vertically then let it fall to the ground. Looking into the pit, Bloomfield was heard to say "Uh oh!". There was a pool of water around the bottom of the vault; not something anyone wanted to see. The sides of the vault were muddy looking and on top were several objects encased in wet dirt. One proved to be some printed material in a plastic bag. Another looked like a large "plat book" from the county records. "That's not unusual" said Bloomfield. "People did things like that with last minute items. 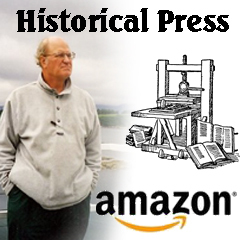 Fortunately, we have copies of those at the Museum". As the B&W picture shows, steel straps were placed around the vault and used as a connector for the hoist that lowered the box into the ground. That seemed a logical way to get it out as well, so chains were fastened and the backhoe begin to lift... until the straps parted and came flying out. The bottoms had rusted away. After more discussion the backhoe was used to tip the vault. Heavy straps were put around it and the vault was gently lifted out and onto the ground. Other than a few gallons of water obviously draining out of the bottom, and a layer of mud and dirt, the vault seemed to be in pretty good shape. It was loaded onto a truck to be taken to a County building at the Fair Grounds. On Thursday Bloomfield and museum staff will examine the vault and, depending on what they find, will attempt to open it. Little is known about the construction other than it was a plywood box clad in sheet metal with lead covering or sealing some of that. So what is inside? Who knows? Hopefully it isn't mushy soup. Chains are attached with the idea that the concrete cap can be lifted off. Either a chain broke or one just slipped off the concret. Either way, it made a loud crack causing everyone to jump. The better method proved to be just lifting the slab and letting it tumble onto its back on the grass. First view of the capsule. The rectangular piece is actually a large book, probably a "plat book". for as long as a year before any attempt is made to open it. Ron Bloomfield (center) gets his first look. Eric Jylha, in the background, and Blake Coppinger look on.